The afternoon I pre-fished, it was bright, sunny, dead calm and hot; the absolute worst conditions I could ask for. But I knew that if I could piece something together under these conditions, I would be in good shape come tournament day. After 5 hours or so on the water, I had eliminated a lot of areas that didn’t hold fish! 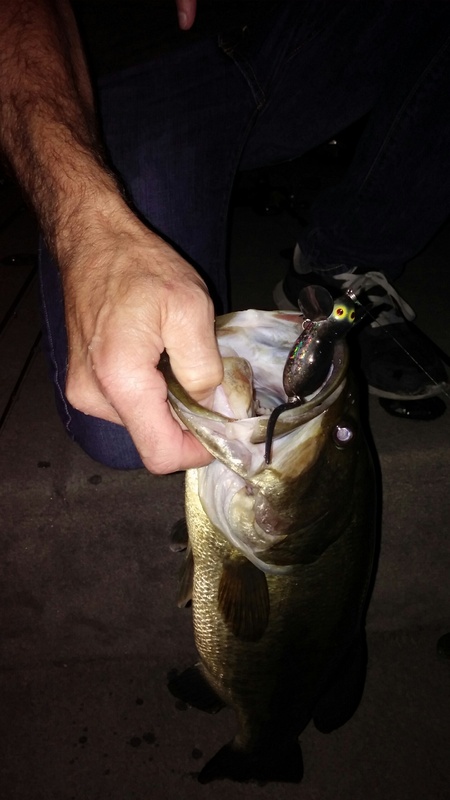 But I also landed some bass in some areas that looked promising, and that was half the battle. So I went home knowing what I wouldn’t be doing and with a pretty good idea of what I would do come tournament day. The tourney came, I worked my game plan and started putting bass in the boat within the first 15 minutes. I dropped two of my first three, which was pretty discouraging, but I kept my head in the game and stayed focused. When the weigh-in was over, I had nailed down a win, being the only angler with a limit! The homework had paid off. I was pretty psyched, because we would now move into our summer stretch of 4 night tournaments. And for those of you who know me at all, you know that night fishing for summer bass is my absolute favorite way to fish. 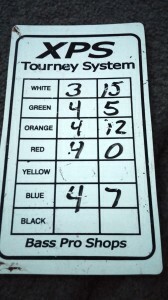 Tourney #4 was also held on a lake that I am very familiar with, so I didn’t bother pre-fishing. I had a good idea where the fish would be and what they would be doing, so I just winged it. And it all worked out very well, as I pieced together an on-the-fly game plan and loaded the boat in good fashion. 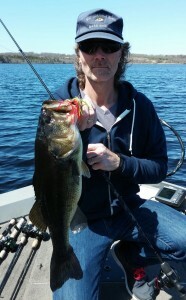 When the weigh-in was over for this one, I had bagged over 20 lbs. of bass and nailed another win. Things were looking up! So let me go over the numbers a little to give you a better idea of where I was in the AOY (Angler of The Year) standings during these first 4 tournaments. As I mentioned, after tourney #1 I was in 6th place, almost a full 10 pounds behind the leader. After tourney #2 I had moved up to 3rd place, but was now actually 10 1/2 lbs. out of the lead. So even though I had moved up, I had fallen further behind! Tourney #3, even though I scored a win, had very low weights, so I gained on the leader, but not too much. I was still sitting in 3rd place, but I had cut the deficit to a little less than 7 lbs. And after sacking 20.66 lbs. 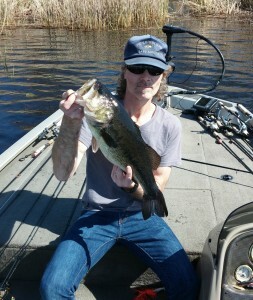 of bass in tourney #4, I was now in the lead by a slim 1.6 lbs. But at least I had clawed my way to the top. Now I just needed to stay there and try to build a cushion. On to tournament #5. This was being held on another one of my favorite night lakes, although I hadn’t won a tournament there in the last 5 years or more. I did manage to land in second place there once, with a 6 1/2 lb. kicker fish anchoring that bag, but a win had eluded me up to this point. Tournament night came and we were faced with a super moon that rose before we started and wasn’t going to set until the wee hours of the morning. I knew it would probably be a slow, tough tourney with the bright light of that moon. And I was right. But I put my nose to the grindstone and fished hard, doing what I knew how to do best, and it started to pay off, one fish at a time. By the time we hit the three hour mark I had my limit and was working toward my first cull fish. My weight wasn’t great, but at least I had somewhere around 11 lbs. As the night wore on, I managed to cull out a couple of my squeaker fish and replace them with semi-respectable fish. But I still lacked that good quality I was looking for and I had no fish over 3 1/2 lbs. I needed a kicker or two! 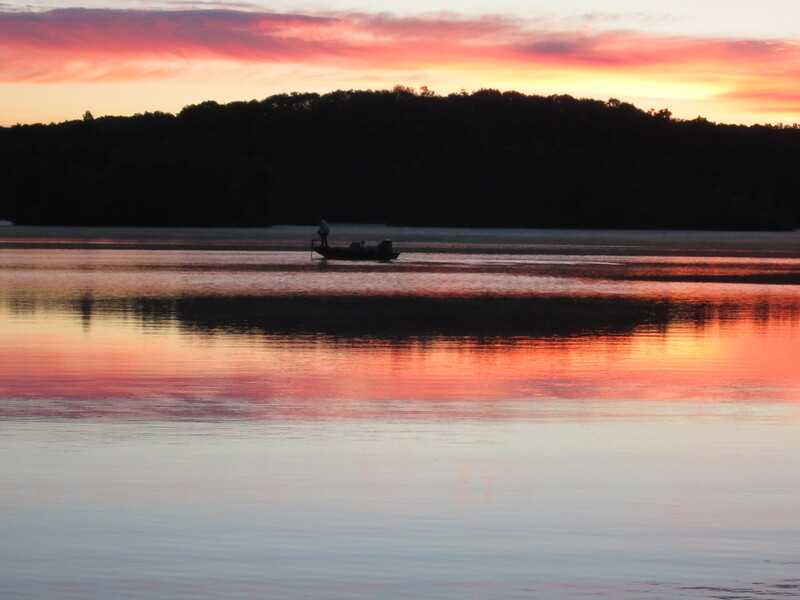 As we approached daylight, I wanted to put myself in a spot where I thought the fish might move in to feed at dawn. I’ve done that in past tourneys and put some really nice fish in the boat in a short period of time. So I headed to a spot that I had a hunch about and started saturating it with casts. 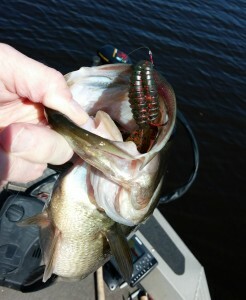 Before too long, I tossed the soft plastic craw imitator out and the line took off to the side. I set the hook and huge bass took off in the other direction! I played the fish into the net, hoisted it up and unhooked it. Into the livewell it went, all 5+ lbs. of it! Maybe I was onto something here. 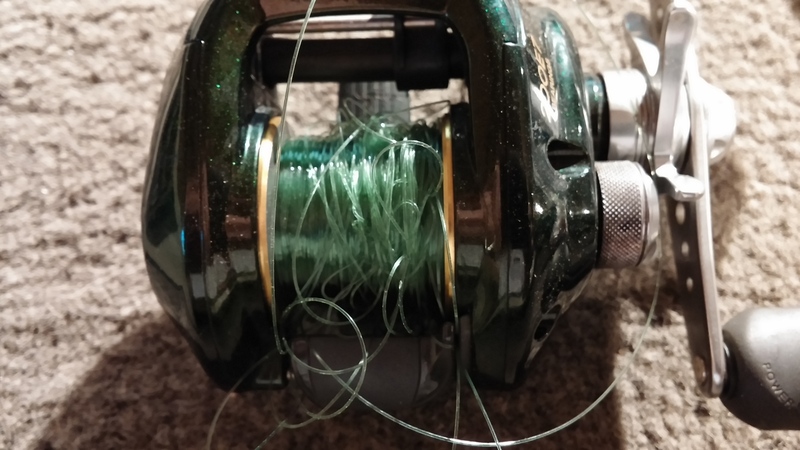 I cut off a foot of line, retied and rigged a new soft plastic bait and tossed back to the same spot. I felt a sharp tap, reeled up the slack and drove the hook home. Another really nice bass cleared the water and stretched my line before being netted and placed in my livewell. Once more, I cut off a foot of line and retied and rigged a new bait and tossed back to the same spot. No takers. I reeled in and made another cast and was rewarded once more with another quality fish! In that short 5-7 minute span, in 4 casts, I had landed over 11 lbs. of bass, giving me a serious weight upgrade. I was psyched as the tourney wound down and I headed to the weigh-in. I wasn’t counting my chickens before they hatched, though, because this lake took some serious weight to win on in years past, and although I did have some serious weight, I knew better than to get too excited yet. One by one we weighed in and when everything was said and done, I had scored my third consecutive tournament victory with a 17.14 lb. bag and a 5 1/2 lb. kicker. This win had now pushed me to a 7 1/2 lb. lead in the AOY race! Tournament #6 was held on a lake that doesn’t have public access after dark. The entrance is located inside of a CT state park and the entrance gate gets locked at sundown each evening. This lake was also a considerable distance from my house, so pre-fishing was not an option. I went into this one armed only with a little knowledge from a few past tourneys there during the last 10 years. Going into, though, I had a plan based on that limited knowledge. Tournament night arrived and we all took off to our initial spots. The spot I had planned on hitting first already had another angler on it, so I fished close by, on what I had planned to use as my backup spot. That spot produced two decent keeper fish in the first 10 minutes of the tourney and then they seemed to shut down quickly. So now I was faced with the decision whether to stay put and hope other fish would move into that area during the night, or cover water and look for roaming fish. I opted to stay put for a while and move back and forth between that spot and the spot that was my first choice, once the other club member decided to move on. Sadly, neither option worked out. I spent the next several hours just trying to find a single fish willing to bite. I covered water and tried areas where I had caught them last year. I went back to my first two spots a few times. All to no avail. Regardless of what I tried, nothing happened. I was at a dead end! After many long hours of searching, dawn was approaching. I wanted to try to position myself in a good spot where the bass might move in to feed. So I headed back to the rock pile where I had caught my other two fish. I had lost a really nice fish there last year at dawn, so I hoped that maybe I could catch just one or two more fish there. I was confident that if I could catch just one or two more keepers I could win the tourney. I had a feeling the winning weight was going to be very low, so I only needed 6-7 lbs. to feel confident enough to win. Well, the rock pile produced nothing, but another spot close by yielded a solid bite. I set the hook and the fish started coming my way. And then it cleared the water. The fish went one way and my spinnerbait went the other way. I knew it was over then. That fish was a solid keeper of at last 1 1/2 lbs. I know that’s not big, but on a night like this, every ounce counted! I headed to the weigh-in with my two decent fish, but I had little hope of placing with just two fish in the livewell. The weigh-in went pretty quickly because there were few fish caught. Only one angler had managed a limit and that limit weighed a paltry 6.06 lbs., but was good enough for the win. 2nd place was held down by just two fish; a 4 lb. kicker and a 1 lb. rat. I landed in third with my two fish, with 4.73 lbs., just a bit more than 1 1/4 lbs. out of first. Had I not dropped that one fish at dawn, I would have had the weight needed to win. My plan actually worked, but I made a mistake and lost the winning fish. Thankfully, the winning weight wasn’t much more than my weight, so I didn’t fall back in the AOY standings. I was still solidly in 1st place, with a 10 lb. lead. 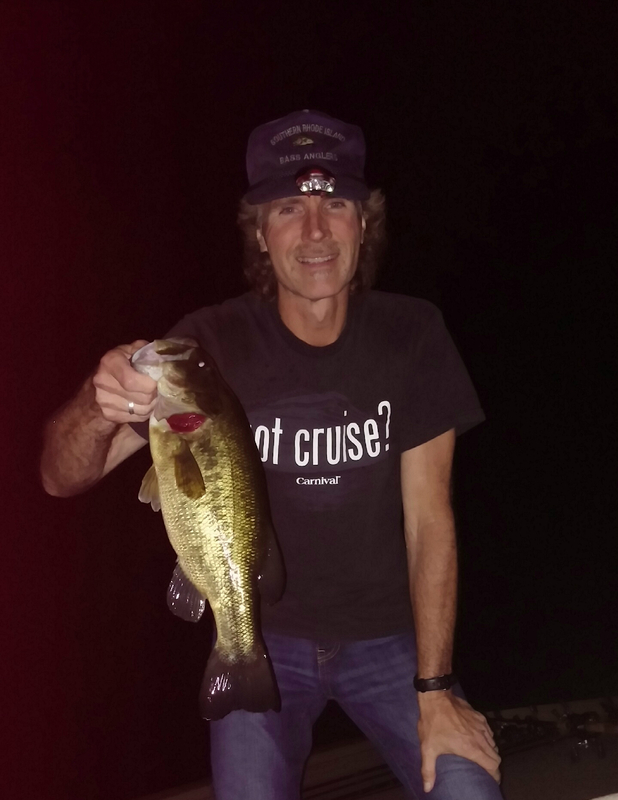 This one was also held on a lake that was a good distance from my house, but there was no gate to close after dark, so I made the long trek and pre-fished it about a week before the tourney. I knew this lake somewhat from fishing there intermittently over the past 20 years, but I had never fished it during an all-night tourney. And 90% of my fishing there had been during the month of May, during the pre-spawn, not in August with 80 degree water temperatures and bass in their summer haunts. During my pre-fishing time I covered a ton of water and tried to eliminate places that would be a waste of time during the tourney. I also tried to locate some areas that might be worth my time to hit where I thought fish would be caught. I accomplished both, although I wished I’d had another 3 or 4 hours to spend covering more areas. Tourney night came and I headed to my first area. Nothing. No fish. I tried another spot. Nothing. I started to panic. I moved around a little with the trolling motor, but nothing was happening. I stopped myself and told myself to calm down and not fall into the run and gun trap because I knew it wouldn’t pay off. I decided to move to the spot that produced my biggest fish when I pre-fished. Thankfully I landed a fish there within a few casts of stopping there. It was a decent fish. So I relaxed a little bit and decided to fish that area for a bit longer. I didn’t get any other fish there, but I did calm down a little bit. After I had fished that area thoroughly I decided to move to another spot where I had caught a couple of smaller fish the week before. It was a rock pile that dropped off into deep water. As I covered the rock pile with casts, I pulled a few fish from it, but they were small, and getting progressively smaller with each bite! Thankfully, I managed to pull a couple keepers from there, but there were squeakers, at best. Time to move on. I kept my foot on the trolling motor and covered water, working through a long stretch of shoreline where I had also had some fish the week before. Slowly but surely, I caught my limit and began to cull. None of the fish I was catching were big, but at least I was able to get rid of the rats I had caught from “little fish rock” and upgrade, even if it was slightly. Extra ounces were extra ounces, no matter how you look at it! I caught fish off and on for the rest of the night, until just before dawn, and then my bite died. I headed in to the weigh-in knowing that I had 5 OK fish, but nowhere nearly enough weight to place on this lake. I was right. 1st place was over 15 lbs. 2nd place was 11 lbs. and 3rd place was a tad over 9 1/2 lbs. I had 8.38 lbs. That was good enough for 4th place. So even though I didn’t win, I was happy that I didn’t finish too far back in the pack. The big bummer, though, was that I finished 7 lbs. behind the winner, so my lead in the AOY race was now cut to 7 lbs. I was a little nervous as we headed into tournament #8. 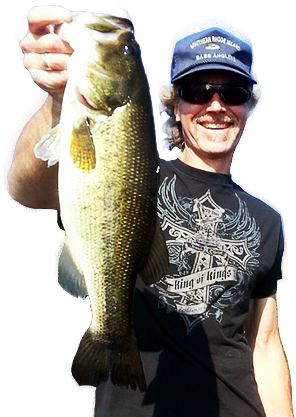 It was a daylight tournament on a lake where the angler trailing right behind me had spent a lot of time and could potentially catch me. Or if I had a really bad tourney, he could pass right by me! But I also know this lake pretty well. It’s where I do a lot of my guide trips each year, so I had some ideas of my own as to how I would attack it. So tournament morning came and I went to work. My first spot had good potential for some decent fish, since I’ve caught several bass over 4 lbs. there over the years. I approached it from a few different angles and fished it thoroughly and patiently. Sure enough, fish #1 came aboard. Solid keeper a little under 2 lbs. Soon, fish #2 came and joined #1 in the livewell. This was a nice fish, well over 3 lbs. I spent a bit more time there and managed another fish a short distance from that first spot, as I worked my way to another area I wanted to hit. 3 in the well… 2 more to go! By now the sun was starting to peak over the trees and I knew that the early morning bite was gone. Now it was time to buckle down and fish slowly and patiently, looking for quality over quantity. And I had a good idea of how to go about doing that, so I set about it. After a while, and landing a couple of shorts, I landed keeper #4. It wasn’t huge, but it was another solid keeper. Just one more decent keeper and I would have a decent limit in the boat. Slow and steady, I worked my through another area and found some new weeds that looked promising. In fact, I saw a bass scoot away as I moved through them. The trouble right now was that the sun was high and the sky was clear, and there was no wind whatsoever. So casts had to be long and everything had to be subtle and stealthy. My phone rang, so I grabbed it. It was my wife. I reached for my handy bluetooth headset, slid it on my ear and turned it on. I could now set the phone down and talk hands-free while I fished. This fish was pretty close to 4 lbs., so I now had a really nice limit in the livewells. I felt pretty confident that I had enough to win, but you never know until the scale tells the tale, so I kept fishing methodically and thoroughly. Weigh-in time came and I heard people talking about it being a tough day, so my confidence started rising, hoping that I might have enough to win. When everything was said and done, my 5-fish bag weighed in at 13.73 lbs. and clinched the 1st place spot! I had just scored tournament win #4 for the season! My game plan had paid off. Whew! And the club member who had been 7 lbs. behind me in the AOY race going into this tournament ended up having a pretty rough day, landing only 3.87 lbs., so I gained almost 10 lbs. on him. SO as we headed into our last tourney of the season, I was carrying a 16 1/2 lb. lead for AOY. I breathed a sigh of relief. Tournament #9 came and I knew it would be a tough one. We’d had a drought and water levels were getting extremely low everywhere, including on the river that we were going to be fishing. In fact, it was the lowest I had seen it in the 25 years I’ve been fishing on it. I knew it would take hard work to do well. I ended up pre-fishing it twice in the two weeks leading up to the tourney. The first time I hit it, I spent time scouting, treating it like it was all new to me. I was keeping an open mind, figuring I might find new spots that held fish. As it turned out, I didn’t really find anything new, so I tested my tried and true spots. The week before the tourney, I hit it once more with a good friend. We fished really slowly through areas that I was already really familiar with and I boated 11 or 12 bass, including a few nice ones. I knew for sure what I would do the day of the tournament. Tournament day arrived and it was pretty chilly in the morning, with air temps of just 53-54 degrees. But they were predicting a high of 75 by mid-day, so I knew the sun would play a part in the equation as the day wore on. We blasted off and I headed to what I figured would be my best spot of the whole day. I planned on planting myself on it and staying there until I had squeezed every last bass out of it. Fish #1 hit the livewell less than 10 minutes in. Small keeper, but a keeper nonetheless. 15 minutes later fish #2 hit. I set the hook and the fish came unbuttoned almost immediately. Ouch. A few minutes later, fish #3 hit. I set the hook, the fish tried to pull me into some brush, but I turned it around. It was a decent fish or at least 2 – 2 1/2 lbs. A couple of seconds later this fish surfaced, shook it’s head and waved bye bye to me. Now I was shaken. 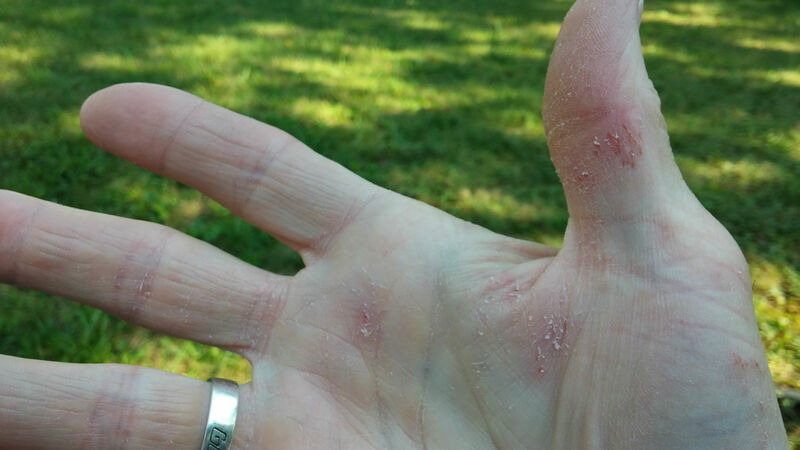 I just lost two solid keepers on a day when I knew bites would be hard to come by. I tried to stay calm, but I had a sinking feeling, wondering if I could have done anything different that might have put at least one of those two fish in the boat, especially that last one. I stopped and breathed for a few seconds and tried to calm myself down. And then I went back to fishing. About 15 minutes later, while still working the same area, I had bite #4. I set the hook, the fish pulled back and then the line went really tight, as though it had pulled me into the brush. I kept the pressure on, but my gut feeling was that the fish had wrapped me in the brush and gotten free. Which it had. Now I was completely flustered as I had lost 3 of my first 4 bites, and they were all good keeper fish. I should have had 4 good keepers in the livewell at this point. Instead, I had one keeper fish that weight about 1 1/2 lbs. Time to push ahead and not let it get me down. Easier said than done! Still working that same area, I finally landed bite #5, giving me two fish in the livewell. This was a good one, so at least I got this one aboard with no incidents. Now it was time to try to put a new plan together. I decided I would just work my way through the series of spots where I felt they would be holding now that the sun had gotten high in the sky. I began targeting heavy brush cover where I figured they’d be buried, hiding from the sunlight. After a long while and many, many casts and pitches, keeper #3 came over the side of the boat. A solid keeper of at least 1 3/4 lbs. This fish was deep in some brush and laydown logs. I had to make several pitches to that tangled mess to get it to bite. So now I knew what to do for the remainder of the day. 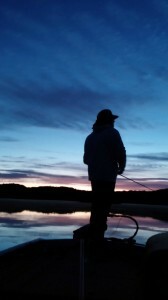 I kept working isolated laydowns and log jams, slowly and tediously, tossing a couple of different soft plastic baits as deep into them as I could get it. Finally, with just 46 minutes left, I felt that familiar “tick” on the other end. I set the hook and the rod doubled over as a fat largemouth tried to muscle its way deeper into the laydowns. I applied pressure to the 17 lb. line and the fish came clear of the brush. I could see and feel that it was a really nice fish! I played it to the boat and slid the new under it, hoisting it aboard. I breathed a sigh of relief because I knew that this fish, even though I didn’t have a limit, would put me close to the top at the weigh-in due to the tough conditions. I fished for a bit longer, hoping to land one more keeper, but it just didn’t happen. So I headed to the weigh-in to see where I’d end up. 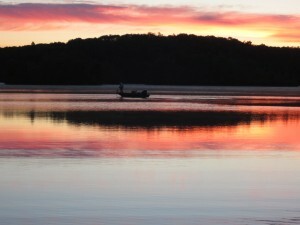 Bass weren’t very plentiful, with several anglers coming in with just one or two fish, and mostly small fish, at that. I brought my fish to the scales and the digital display said 7.82 lbs. Not bad for the day I had and for the overall conditions. I weighed my kicker fish and it read 3.01 lbs. on the digital display. Two other club members managed a limit, but one of them was a bag of small fish. The other angler, though, had some nice fish and tipped the scales at 9 lbs. even. He clinched the top spot, and he deserved it. I was disappointed in my performance (or lack of it) during that first 90 minutes of the day, but my persistence had paid off and gotten me another top three finish and the lunker for the tourney. So, with that last tourney now over, I had clinched the Angler of The Year title. To say that I had a good year would be an understatement. I had a great year! And I am so thankful. My patience and persistence really paid off. I spent time this year pre-fishing whenever I could and then trying to formulate a game plan based on what I found while pre-fishing. And I have to say that it really helped me a lot. God has truly blessed me. I want to give a very big thank you and shout out to Lure Parts Online. I caught a huge percentage of my fish this season on their Salty B-Bug, including some truly big fish. This is a quality soft plastic bait that’s very affordable and it catches fish like crazy! I’d also like to thank Lewis & Wright Bass Fishing Technology. I began buying their Kellee Stick worms a couple of years ago and I have to say that they’re the best I have fished with. Period. They also helped me to put some good fish in the livewell and win some tourneys. And my G3 boat has been fantastic to use in tournaments. This is truly a quality piece if equipment that has helped me in my tournaments and while guiding clients on local waters. So that’s it! 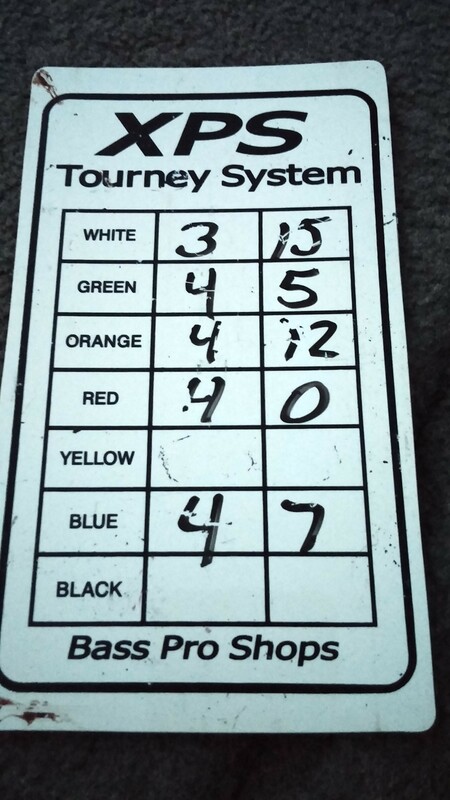 My 2014 tournament season wrap-up. I hope you’ve enjoyed reading it as much as I’ve enjoyed putting it all together.